Grid Iron and the Traverse Theatre’s new co-production Jury Play is a play of two halves with rather mixed results. Based on Dr Jenny Scott’s research into jury members’ experiences and how to improve them, director Ben Harrison and writer, Dr Jenny Scott, have decided that the best way to bring these issues to life is to cast the audience as the jury in a fictional murder trial. It’s a strong concept that proves remarkably effective in the first half. We observe that trials are actually incredibly dull, evidence is presented all out of order, and everyone speaks in antiquated jargon. It’s a world away from the classic TV court case dramas. Throughout the court case, numerous voiceovers share the jury members’ thoughts. They sometimes relate to the trial, but more often than not they deal with real life problems, such as when their kids will be picked up from school or when they’ll be able to have a cigarette break. This brings a lovely and relatable human touch to the otherwise stale and impersonal trial. With the added benefit of audience members being chosen, we can all understand how disruptive and uncomfortable jury service can actually be. The format largely continues as such. 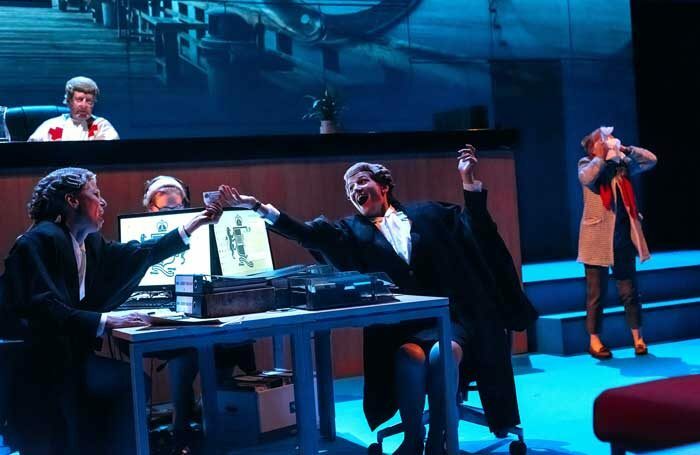 The creative team deconstructs the experience of a court case, from the repetitive and manipulative questioning to the sheer length of time that trials are last. It’s a rare situation in which boredom is not only a necessary but also an enlightening aspect of a production. However, the second act undermines most of these pertinent issues. It’s revealed that two of the jury members are actually actors which, though somewhat necessary, betrays the importance of the audience-as-jury and, ironically, deprives them of their own voice. The two ‘jury members’ speak out against the Judge and asks him what they’ve been thinking the entire time, leading to him deciding to restructure the courtroom to be more conducive to normal people’s needs. The inevitable debate about maintaining formality and tradition over widening accessibility ensues, but it’s nowhere near as effective as the first half was – it’s as if Harrison forgot that showing is much more powerful than telling. By the end, the question of if the defendant is guilty or not guilty ceases to matter and we’re left to put our old-fashioned legal system on trial instead. It’s certainly interesting but it frustratingly doesn’t acknowledge the criticisms against reform other than the straw men argument of tradition. Despite its obvious merits the jury’s still out on Jury Play. Jury Play runs through 7 October.